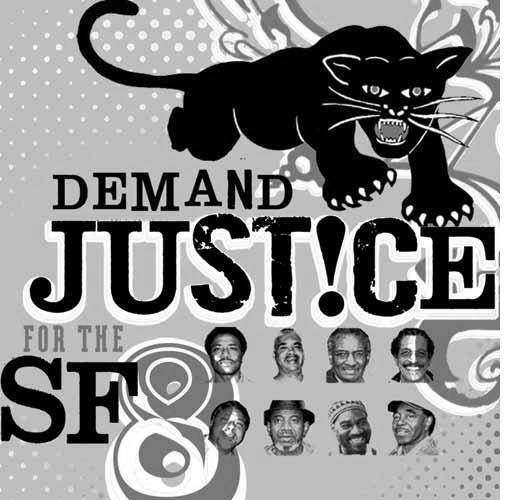 On the same day that U.S. Attorney General Alberto Gonzales announced that people do not have a constitutional right to challenge their imprisonment, nine former Black Panther Party leaders and community activists were indicted for something that happened over 35 years ago, the killing of a San Francisco policeman. And if today’s support rally is any indication, the Bay Area progressive community will not tolerate this outrageous attack on the Black Liberation Movement. Richard Brown, Richard O’Neal, Francisco Torres, Ray Boudreaux, Hank Jones, and Harold Taylor. Two well-known political prisoners, Herman Bell and Jalil Muntaqin (aka Anthony Bottom) part of the New York Three, who were falsely accused and convicted of killing two New York City policemen, have also been pulled into this ancient and unjust case. John Bowman, one of the targets of the two-year long grand jury witch hunt, died in December. Why did the government indict this group of Black freedom fighters now? Why has the government relentlessly pursued these activists more than 35 years after the alleged “crime” was committed? Today, a local activist media collective, Freedom Archives, premiered their latest exposé of racism and injustice in this country, “Legacy of Torture: The War against the Black Liberation Movement.” The new DVD documented the torture of several of the arrested activists, Bowman. Jones, and Taylor at the hands of the New Orleans police department in 1973. Several of the men were incarcerated for refusing to testify before the grand jury. The video also captured the level of police brutality, assassinations and abuse suffered by the Black community during the 1960s and 1970s. According to the Committee for the Defense of Human Rights (CDHR), a group devoted to exposing human rights abuses against progressive organizations and individuals, thirteen Black activists, were arrested in New Orleans in 1973 and tortured for several days in a similar manner to today’s torture at Guantanamo Bay and Abu Gharaib prisoners. In “Legacy of Torture,” Bowman, Jones and Taylor graphically described being stripped naked and beaten by slapjacks and blunt objects; probed by cattle prods in their genital areas; and nearly suffocated by plastic bags being placed over their heads and wet wool blankets wrapped tightly around their bodies. The government failed in the early seventies to bring any of these men to trial for the killing of San Francisco policeman John Young. In fact, all of the coerced false confessions from New Orleans were deemed inadmissible by California courts due to the physical abuse and torture suffered by the men. Brown, who has spent the last 30 years working with young people in this city’s African American community, in an interview in the San Francisco Bay View newspaper, denounced the government’s violence against the Black Liberation Movement. “I was named as a participant in 1971 in the murder case. All Panthers were targeted. If we were doing something constructive, we were singled out. They killed Bunchy Carter, arrested and imprisoned Geronimo. It was just our turn. We were next on the list,” Brown stated. Soffiyah Elijah, a New York-based attorney who has defended many Black freedom fighters, spoke briefly at today’s program which drew so many people to the Roxie Theater, the movie had to be shown twice. “In the wake of 9/11 and the Patriot Act, the government is now resurrecting its COINTELPRO actions. Homeland Security is merely an extension of that effort,” Elijah said. COINTELPRO was the domestic government program used to undermine, disrupt and assassinate the leadership of domestic liberation movements, revolutionary organizations and progressive groups in this country protesting U.S. government policies in the 1960s and 1970s. John Bowman, had this to say in “Legacy of Torture,” now dedicated to his memory, “I am sick of these people trying to destroy our community,” he said. The support at today’s program echoed this sentiment as hundreds of people signed-up to become involved in the defense effort. A large crowd attended John Bowman’s memorial at the African American Art and Culture Complex following the film showing. For more information about how you can support these activists or purchase a copy of the new video, go to www.cdhrsupport.org or www.freedomarchives.org.